Why choose us for your new stove? We are professional installers of a wide range of stoves including wood burning, gas, multi fuel and inset stoves. Our trained engineers are HETAS approved and Gas Safe registered. You can rest assured that all work will be carried out to the highest standard from start to finish. If you don't believe us, check out some of our reviews on Checkatrade. If you are looking for anthing stove, simply get in touch with us today. We are always more than happy to help. 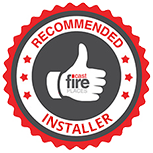 Established in 1997, FDC (UK) Ltd has grown to become one of the leading trade distributors of fireplaces and related products in the South of England. Based near Salisbury, they hold comprehensive stocks of our entire product range within 20,000 ft of warehousing. The FDC fireplace range caters for all tastes and budgets. With a wealth of product knowledge, computerised sales office and an unrivalled distribution network of their own vehicles, they aim to provide an efficient and quality service to all of their Stockists.